The Steel Dragon Tools store is now open on Amazon. All Steel Dragon Tools products are all available and easily searchable. Most products are eligible for two-day shipping through Amazon Prime. Contractors and skilled tradesmen can quickly and conveniently get the tools they need to get the job done. Steel Dragon Tools manufacturers a wide variety of tools and components used for pipe threading, roll grooving, core drilling, drain cleaning, wiring stripping applications. The Steel Dragon Tools product line also includes drain cameras, pipe chain vises, magnetic lifters, electric hoists, specialized hand tools, and more. All new products from Steel Dragon Tools meet or exceed industry ratings and are CE approved and government tested. In addition to offering a line of professional-grade, economically-priced pipe threading machines, Steel Dragon Tools also refurbishes and reconditions RIDGID® brand pipe threading machines and RIDGID® accessories. All Steel Dragon Tools® Reconditioned RIDGID® tools are cleaned, repaired, and prepared for professional use. Each Reconditioned RIDGID® tool is disassembled, cleaned, and reassembled with new parts as needed to meet OEM specifications. All Reconditioned RIDGID® items come with a one-year warranty. Visit the Steel Dragon Tools store at Amazon, click here. For more information on Steel Dragon Tools call 734-224-7112 or e-mail customer service here. Steel Dragon Tools rebar cutters can be kept in peak operating shape for years to come by following these simple tips. For more information on Steel Dragon Tools rebar cutters, click here. Steel Dragon Tools rebar cutters can cut other materials, but it is important to remember to use the proper tool for the job. The failure rate for these machines will go up when using it for a purpose other than cutting rebar. Hydraulic rebar cutters, even the manual kind, will make quick work of cutting thanks to the assist from the hydraulic pump. Be sure to use a standard, agriculture-grade hydraulic fluid to fill or re-fill the pump. Hydraulic fluid is the power behind these cutters. If the cutter pump is low on fluid, it will not cut. Low fluid levels will degrade pump efficiency of the electric rebar cutters. The clearest indication of low fluid is when the piston starts but stops abruptly. The fill hole for Steel Dragon Tools electric rebar cutter is on the side of the machine. To fill or add hydraulic fluid, lay the cutter on its side and remove the hex bolt. Fill the cutter until the hydraulic fluid is visible in the hole. Insert hex bolt and tighten. It is normal for some hydraulic fluid seepage from the electric cutters. These cutters come with hydraulic fluid but will need to be filled again from time to time. When the hydraulic fluid is low, both cutting speed and power will be reduced. Rebar is one of the hidden materials of the construction world. It gets buried in concrete and quickly forgotten. But any concrete or masonry structure requires rebar and as a result, construction workers need to be able to cut the rebar to spec. There are several ways to cut rebar, including reciprocating saw, circular cutter and hand saw. Rebar cutters, both hydraulic and manual, will cut the rebar much quicker and more efficiently, saving construction companies valuable time on the work site. Steel Dragon Tools manufacturers three types of rebar cutters; electric hydraulic, manual hydraulic, and manual. All three types are designed to quickly cut rebar and all three are portable and easy to use. Steel Dragon Tools electric rebar cutters use an electric motor to drive a hydraulic pump. These machines come in three different cutting capacities. The RBC05 will cut 5/8-inch, #5 rebar. The RBC06 will cut 3/4-inch, #6 rebar. The RBC08 will cut 1-inch, #8 rebar. Each cutter will cut the specified size of rebar and below. All three offer a cutting speed of six seconds or less. These machines will cut construction rebar, deformed steel bar, round steel bar, and rebar rod. Each machine comes with a heavy-duty carrying case and tool kit. The tool kit includes wrenches, Allen wrenches, screw driver, and a one-time use hydraulic oil bottle. The Steel Dragon Tools 22A manual hydraulic rebar cutter will cut up to 3/4-inch, #6 rebar. This cutter features a sturdy steel construction and comfortable rubber grips for ease of use. This cutter is ideal for smaller jobs that does not require a massive volume of cuts. The blades are made of forged steel and will cut construction rebar, deformed steel bar, round steel bar, and rebar rod. 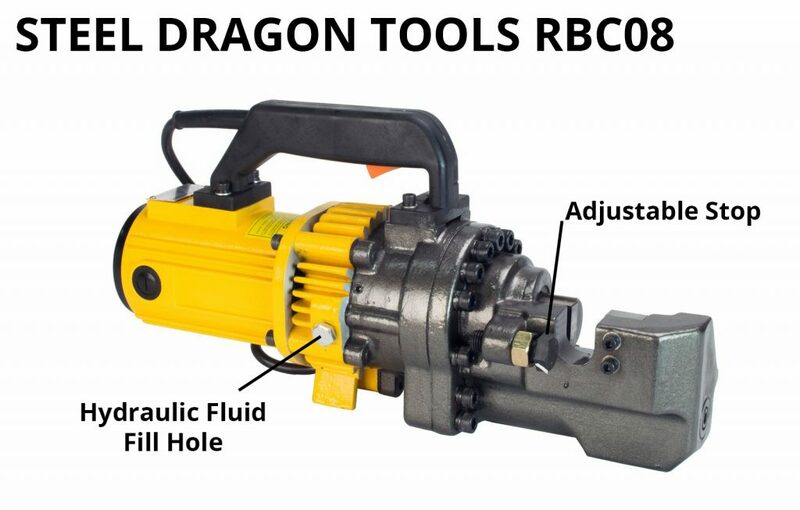 The Steel Dragon Tools RBC625 is a manual rebar cutter and bender that will cut and bend 5/8-inch, #5 rebar. A 50-inch handles give the operator the leverage necessary to cut and bend the rebar. This cutter does not have a hydraulic pump. The RBC625 features mounting holes in the frame so that is may be secured to floor, allowing for easy, one-hand operation.